“Stevie” is one of the most narratively and ethically complex docs ever. It’s incredibly rich and challenging and emotionally difficult. In short, it’s absolutely brilliant. (Four stars) Stevie..."At bottom it is a deeply humane and touching experience -- as fine, a concerned and socially sensitive a documentary you'll find... If there are parts of it that evoke the guilt and fear of the largely repressed issue of class inequity in America, no small part of its power stems from the fact that it works through those things to a state of genuine and unequivocal empathy for a badly damaged -- and damaging -- individual." "Brave...courageous and powerful...Stevie doesn't have the neat, almost poetic ending of Hoop Dreams, because sometimes life doesn't turn out that way. The movie is deeply sorrowful and impossible to forget." "A moving knockout of a documentary...Mr. James dares us to see [Stevie Fielding] as a human being without excusing him for his misdeeds. In the process, he paints a painfully vivid portrait of emotional bonds, responsibility and family in America. Stevie is one of those magical docs that makes you look at the world differently upon re-entering the hard light of day." "A gripping, startingly honest portrait...has all the heartstopping will-the-kid-make-it drama of Hoop Dreams." "Stevie is gripping in its intimacy." "Stevie, directed by Steve James of Hoop Dreams, was the finest documentary I saw at the Sundance Film Festival -- a riveting small-scale epic...Stevie is the rare documentary that takes time to explore its own filmmaker's exploitation of his subject." "Steve James...has filmed this far more personal documentary, which has the dramatic urgency of the best fiction." "Stevie emerges painfully but profoundly as one of the most unusual, if not absolutely unique, efforts in the field of nonfiction filmmaking." 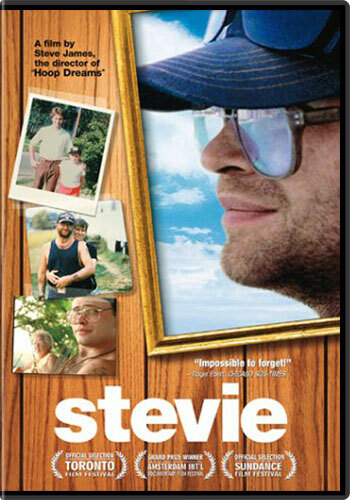 (Four stars) "Stevie portrays a remarkable gallery of real-life characters...It's no accident that this movie is named after both the filmmaker and his subject. It stands with the most thoughtful releases of recent months, and will linger in memory." "[Stevie] is surely representative of all our lost and abandoned. ...if James and his crew can spend years with these blighted souls, surely you can spend two hours with them, exploring compassion's outer limits."